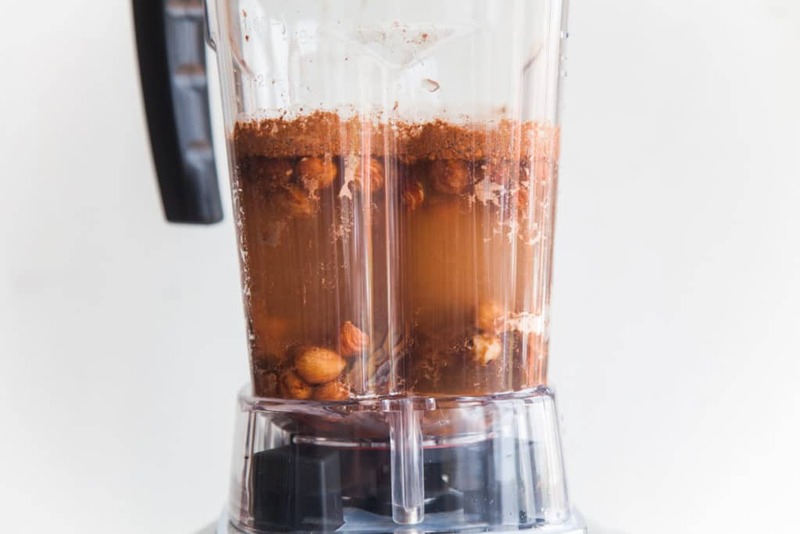 I’ve noticed a distinct lack of nutella-ness in my life, lately so I was inspired to create my own recipe with hazelnuts and chocolate, after Froothie sent me their latest powerful blender – the Optimum G.21. As soon as I opened the instruction manual and saw there was a “nut milk” setting AND a nut milk bag – I knew exactly what I was going to try first. 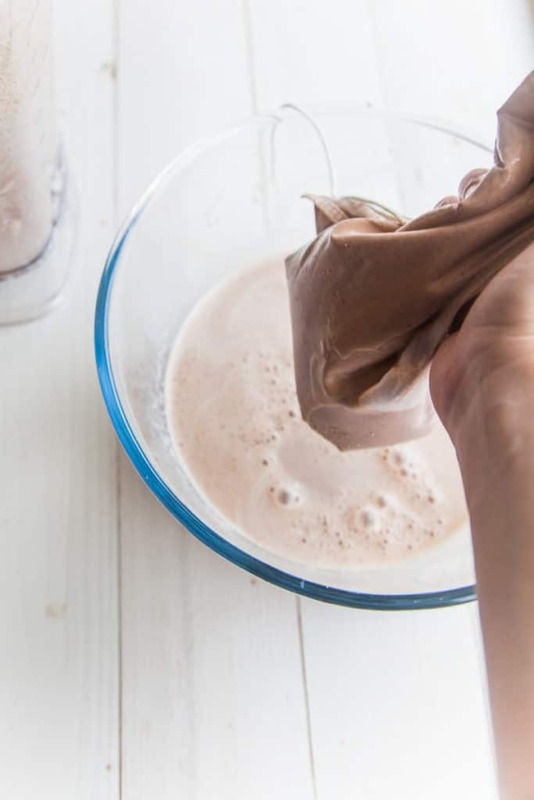 Nutella milk! Scroll down for the full recipe. I am so beyond excited to own the Optimum G2.1. I had heard so many great things about it but have to say it is even better than I hoped for. It’s powerful, easy to use, easy to clean and can be used for so many things! 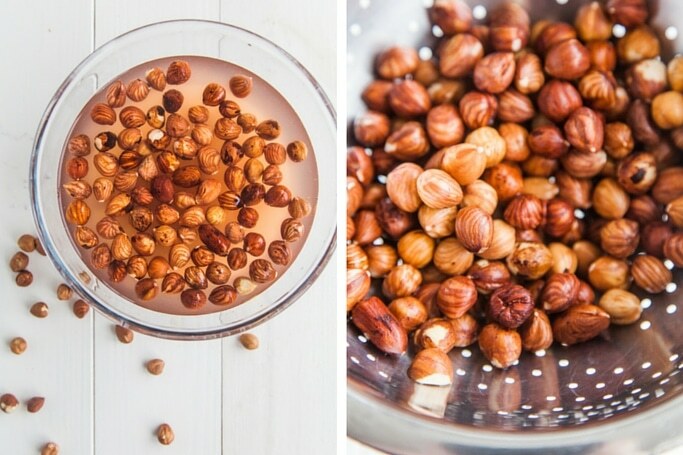 You will need to soak your hazelnuts overnight or for at least 6 hours first. This softens them and removes enzyme inhibitors. Once your ready to make your nut milk, drain and discard the water. Rinse well and add to the blender. 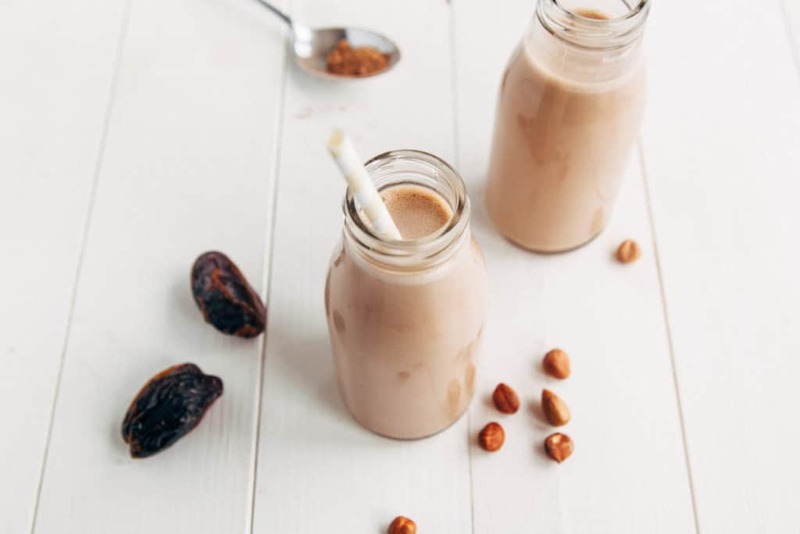 Along with the hazelnuts, add your clean water, raw cacao powder, vanilla extract and pitted dates. Blend! For the Froothie – this is so easy. All you need to do is go to the menu and choose the ‘Nut Milk’ setting. Press start and let it do it’s thing! Once you’ve collected all the milk, simply pour it into 4 glasses or bottles and serve! The milk can be kept in a container in the fridge or up to 5 days. And you know that leftover pulp? Why not make some cookies (you can make them baked or raw) or brownies, chocolates or even dry and grind it into a powder/flour! 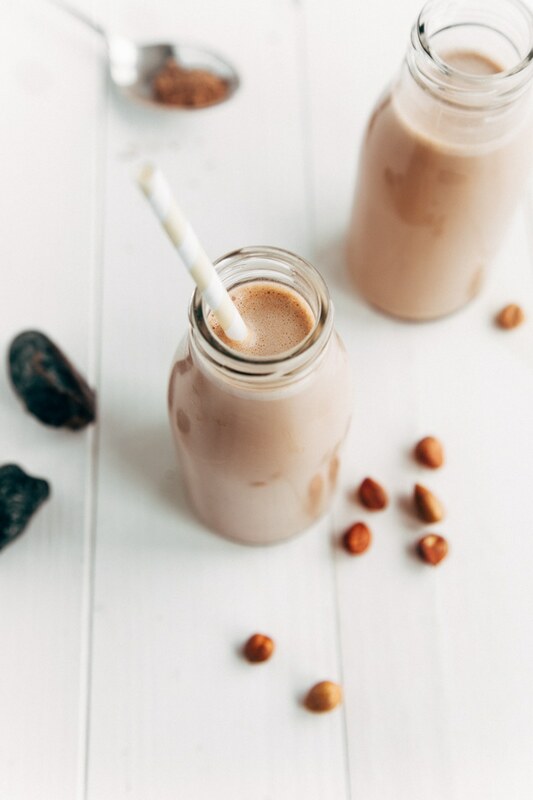 Homemade chocolate hazelnut milk - A delicious beverage that both kids and adults will love! Perfect served with chocolate cookies. Drain the hazelnuts and rinse them well. 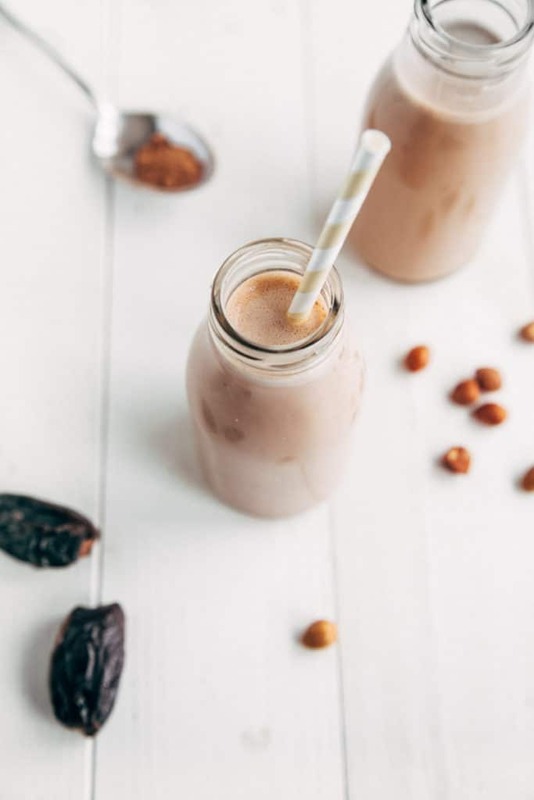 Add to a high-powered blender, along with the filtered water, raw cacao powder, vanilla and dates. Pour into glasses or bottles and enjoy! The milk can be kept in a bottle or container in the fridge for up to 5 days. * Don't throw the pulp away! It can be used for cookies, chocolates, brownies and more. Disclaimer: I’m a Froothie ambassador and links in the post are affiliate which means I may gain a small profit from any products purchased through this link but don’t worry this is at doesn’t cost any extra! Trying this recipe today! I was wondering, do you have a recipe for the leftover pulp? Yes! This is my kind of drink right here. It's also nice to see a new blender that can compete with a Vitamix. Do you find it as noisy as a Vitamix? Honestly, I reckon it's probably just as noisy. I've seen a few people say it's noticeably quieter. Perhaps on certain settings but I don't have much to compare it to since I've only used a Vitamix a couple of times before! Thanks, that's helpful. I won't be purchasing a new blender until quite a bit further down the road, but I always like to research way too early. Haha. No I totally understand that. Quality blenders are a big investment so it's wise to do research! I think you may be my hero! OMG YUM! 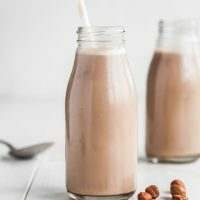 I have always loved chocolate milk, but this is even better! Omg- this sounds like I milk I would drink straight. I hate drinking a glass of milk. 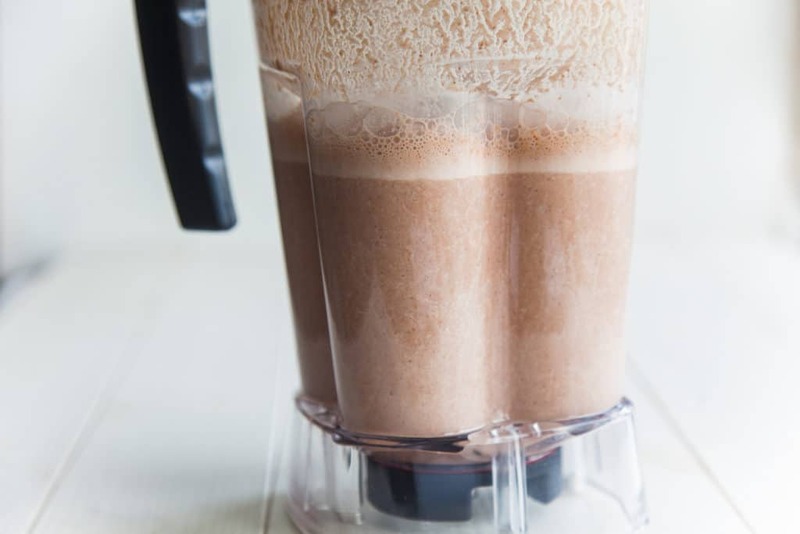 But this would taste more like a milkshake- brilliant! I've not yet tried a nut milk in my Froothie blender and although my Optiumum 9200A doesn't come with a nut bag, I reckon I can manage without. 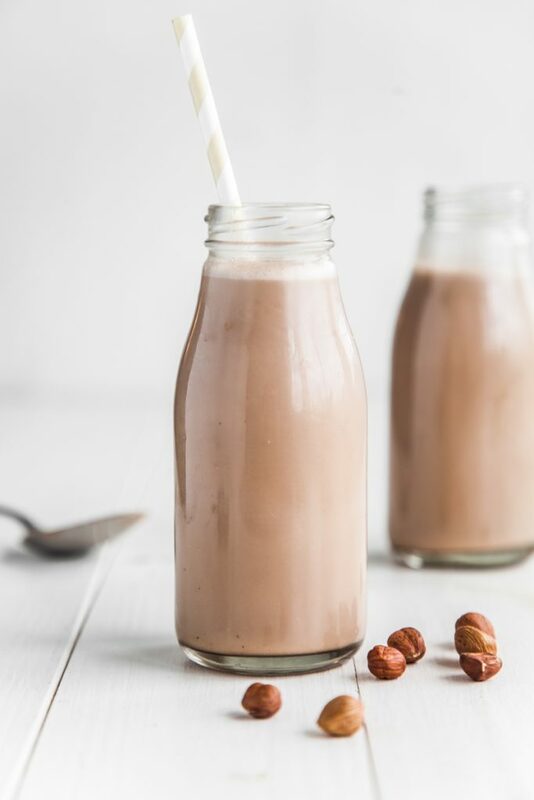 Love your take on nutella milk. Sounds delicious and not overly sweetened either. EEEEEEK! Off to make this in my Froothie, RIGHT NOW! My lot will love this after a long, hot day at school! Yay! Please let me know how it goes. I kept mine in the fridge for a couple of days and it's so nice cold! You could add a few ice cubes to the mix :-) Enjoy! LOVE that idea! I don't have anymore left but next time I make it, it's going on top of some cocoa cereal!